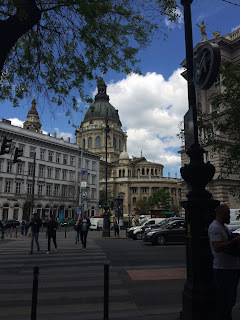 We are back in Budapest, this time for an extended stay of 5 weeks. We will be taking advantage of the easy travel arrangements to visit a few cities and the countryside. The city is starting to feel familiar, with the gorgeous architecture and the grit. The weather is remarkably pleasant, with full sun and 16-20C, which makes roaming around on foot so much easier. In two days Ive clocked 12 km on foot. On our first days, I spent quite some time going to different markets and stores to build our inventory of stuff. I am still perplexed on the shopping habits. When do I bag and tag the fruits? When can I pick my own? Since I was coming down with a cold (thanks to a long germ-infested airplane ride), my next stop was for a warm bowl of soup. This goulash at the every popular Menza just hit the spot. It was Spring of 2016, and my 2 year old untrained stud had just arrived to his new winter home from his lavish Florida paradise. I only had plans for groundwork at first, scheduled our first showmanship and halter show for 2 months later and got to work. I had an excel list of things to accomplish: cross-tying, ground-tying, tarps, lunging, cavaletti, showering, and of course everything that goes with showmanship (stand square, walk/trot at shoulder, pivot). I had devised a thermometer map to track our progress, which looked like this a few weeks before our show. We had been practicing for several weeks. And, before I proceed, I must say that Q was super quiet at home, and did the showmanship patterns relatively well. He would stand square, back, trot forward, and pivot on his right hind (most of the time). He did all of this on a slack line. Q was not too impressed with my plan. I got the snort, the scoot and the jump to the back of the stall when he saw the tarp coming. So by the time I had him in the aisle with his halter on, he was less surprised by their appearance. But he still shrinked away. Then we got into the arena, Q giving the tarp and flag a wide berth until I asked him to approach. You can see how tentative he is. This continued for a while but we eventually graduated to walking and trotting both directions, alternating with some flag work and poll release. My horse and I have an issue with plastic, shavings bags, tarps, and plastic kiddy pools. I can usually get Q to accept my fascination with tarps in a session. But every new session starts out the same with snorting, and a reluctance to have me drape the tarp over him. So I take it slow and we eventually are trotting and cantering over it, and moving it all over. But its exhausting tedious work. After several days of despooking clinic, my husband was tired of hearing me categorize horses into sensitive/reactive vs dull. Well how else do you explain to the non horsey type how a draft cross just plows through the mattress and tarp combo on the first try, while the OTTB jumps from side to side then leaps into the air to finish into a canter pirouette succeeding in completely avoiding the offensive obstacle? Does this work on humans? After four days of despooking clinic and some reflection time, I want to share my broader perspective on what despooking can teach us. Day 1 of the second edition, this time with 16 horses. 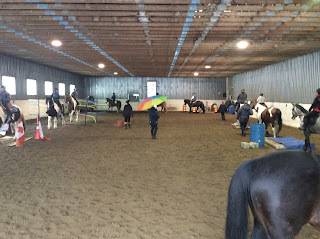 Aside from the first hour of craziness, things proceeded in an orderly fashion and it IS possible to have so many horses in a tight space with multiple obstacles. Makes you go hmmm. 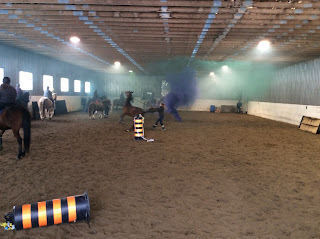 In the first hour, after being fussed over with pool noodles and pom poms, the horses very quickly progressed from the scariness of the first plywood plank to the multiple obstacles including the combo tarp over mattress with the funny squishy sounds. Funny, so many horses had issues with the bubbles. Nobody thought the dancing man would be possible when they started. Now look, calmly proceeding as a herd. Drill formations? As an effective way to despook a horse? That’s a new one. Former corporate executive turned university professor and strategic advisor. The last few years I made some big bold moves in my life and am happier for it.